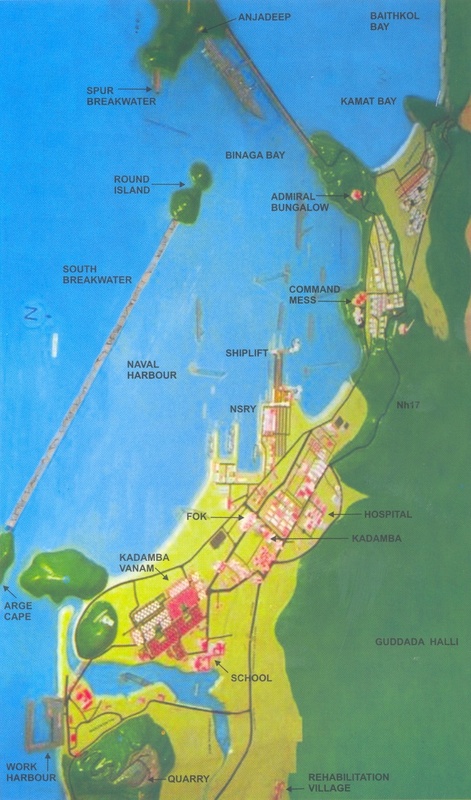 Project Seabird was a program to establish a new Naval Base, the INS Kadamba. This base would be India's first base exclusively for naval ships and the largest. Prior to its existence, naval ships shared space with commercial vessels at the two major ports in Mumbai and Visakhampatnam as well as smaller enclaves in Kochi, Goa and other small ports. A new Naval Base on the western coast was sanctioned in 1985 primarily on strategic consideration for completion by 1995 to provide additional infrastructure for the growing Naval Fleet. Karwar in Karnataka was chosen as the location of this base. The base would is under the jurisdiction of the Western Naval Command. The Naval base was inaugurated by Defence Minister, Mr Pranab Mukherjee on 05 May 2005. The then Prime Minister Late Shri Rajiv Gandhi laid the foundation stone on 24 Oct 1986. The project was originally conceived by Admiral OS Dawson (Retd), PVSM, AVSM, ADC, who was Chief of Naval Staff from 28 Feb 82 to 30 Nov 84. 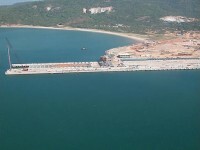 The West Coast was chosen for the location of the new base since the eastern base at Visakhapatnam, which could berth 50 ships, was considered adequate for India's security needs in the east. Mumbai, on the west coast, was too congested due the substantial number of merchant vessels that docked there regularly, often forcing naval ships to wait a day before they could dock. Shallow waters along the channel in Mumbai prevent the berthing of aircraft carriers, which would have to lie in anchorage. Expansion of the Mumbai base was impossible and nearby buildings such as the Bombay Stock Exchange presented a security risk. Furthermore, Mumbai was a mere 580 nautical miles (900 kilometers) from Karachi whereas the Karwar base would be around 900 nautical miles (1,450 kilometers) from Karachi, thus being further away from potential attacks such as via missiles. 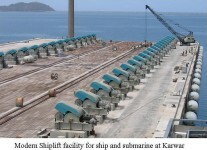 The topography of the Karwar base was also considered valuable by the Navy. Features include sufficient and even water depth permitting easy berthing and navigation, hilly forested terrain to camouflage ground installations and the low occurrence of siltation. The project was beset with abnormal delays. Despite revision of completion schedule from 1995 to 2005, the execution of marine works commenced after 14 years in 1999 raising doubts about the completion of the project even as per the revised schedule. The cost of the project estimated at Rs 350 crore (Rs 3.5 billion) in 1985 increased to Rs 959 crore in 1990 on finalisation of detailed project report and further escalated to Rs 1294 crore in 1995, though the scope of the project was considerably reduced. The Ministry accepted consultancy services for supervision, contract management and quality assurance at higher rates than that quoted by foreign consultant in July 1990, resulting in extra expenditure of Rs 7 crore. Incomplete and inadequate studies by Central Water Power Research Station entrusted with site selection studies prolonged the studies for more than eight years. Tardy progress in implementation of approved rehabilitation package for the affected families despite budgetary allocations for this project led to its revision time and again and ultimately its financial impact increased by Rs 78.20 crore. Investment of Rs 2.64 crore on creation of assets, established to match the proposed commencement of marine works in June 1998 remained unproductive due to non-acquisition of land and conclusion of marine works contract. The Ministry sanctioned in July 1986, acquisition of 6933 acres of State Government revenue and forest land and 5421 acres of private land at a cost of Rs 22 crore. But subsequent developments like (a) minimising human displacement (b) restriction on construction within 200 metres from high tide line, (c) planning of Konkan Railway line through the station and (d) reduced scope of the project necessitated reassessment of land to be acquired. Out of 8175 acres land decided to be finally acquired, 324 acres had not been acquired as of January 2000. The INS Kadamba was commission on May 31, 2005. 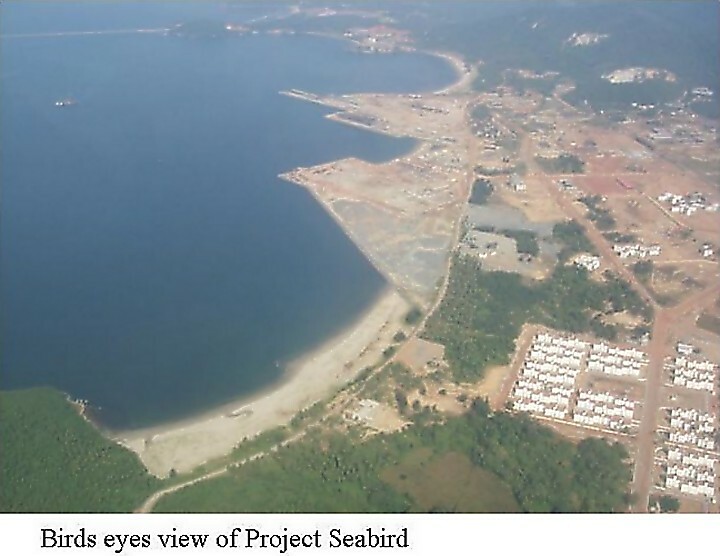 As of then, Project Seabird was being executed on 4480 hectares (11200 acres) of land, which was a mix of forest, revenue and private land. More than 4000 families living in 13 villages have been relocated to seven Rehabilitation Centers. Out of the acquired 3500 hectares of forest land, only 400 hectares have been used for construction. As per the existing policy, 800 hectares of compensatory afforestation has been done. In addition, about 900 hectares of afforestation has been carried out within the Naval area after taking over. Some sources have estimated the cost the total project cost at US$800 million. Due to budget limitations, the Navy halved the original Phase I of Project Seabird. Phase II which will last from 2005 to 2010 will double most of the existing facilities. In addition, a naval air station will also be constructed where large ship-based helicopters will be stationed. 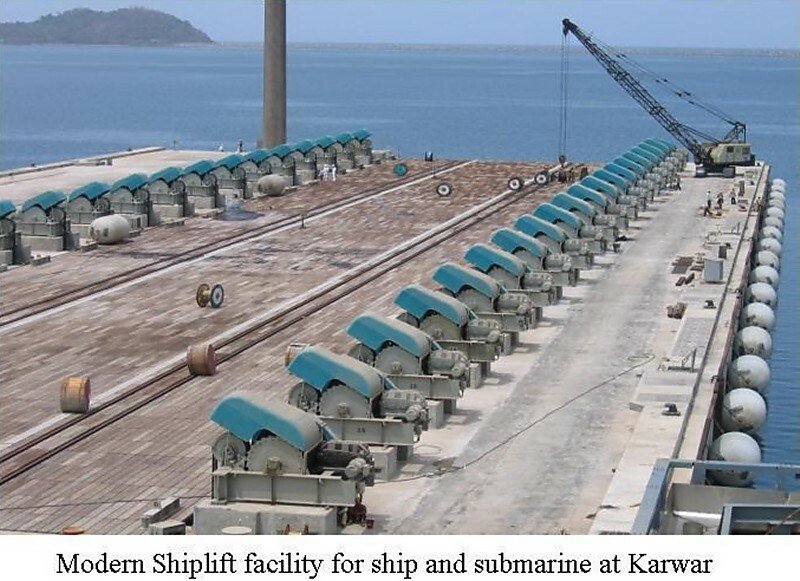 The Navy ultimately plans to berth 50 vessels at Karwar. Currently, the Navy plans to station the operating fleet of the Western Naval Command at Karwar while sending ships for repair and maintenance to Mumbai. 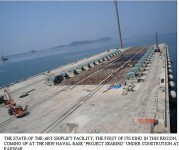 One of the unique feature of the base is the ship-lift and ship-transfer system for dry docking of the ship at the Naval Ship Repair Yard. The ship-lift is capable of lifting upto 10,000 tonnes and measures 175m x 28m. A ship-lift is a large elevator platform that can be lowered into water and lift a ship vertically to the yard-level so that the ship can be moved onto a dry repair berth on land. 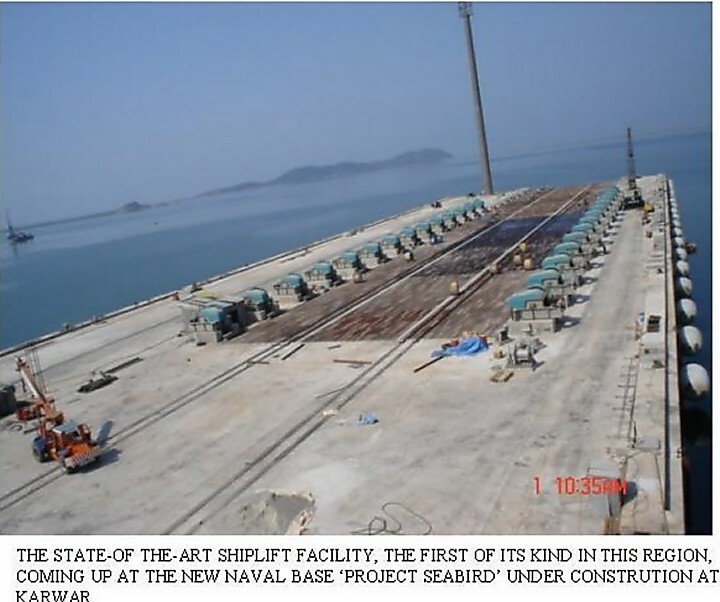 The ship-lift will be able to lift all other Indian Navy vessels except aircraft carriers and supply vessels. Currently there are 2 jetties available for ship-berthing. 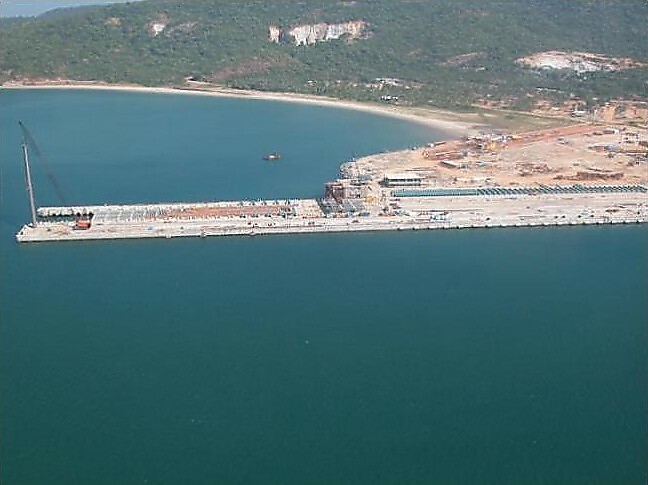 Ultimately, 11 piers will be available which will be able to accommodate 42 ships. Ships will be placed by end 2005 to enable the Western Naval Command with operational flexibilities.